In 1967 Britain’s Tom Simpson famously died whilst competing in the Tour de France, keeling over on the slopes of Mont Ventoux – the ‘Giant of Provence’. At the approach to the summit of this great climb stands a monument to Simpson, and cycling tradition dictates that a token (a water bottle or a cap, for example) be left as a show of respect on the way past. 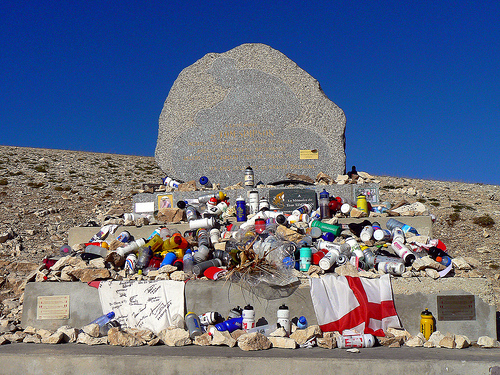 As stage 15 of the 2013 Tour de France was reaching a blistering climax on the peak of Ventoux, just below the summit Millar pulled a cap from his jersey pocket as he passed the Simpson memorial. He flung it to one of the fanatical fans so central to the day’s drama. The fan, gloriously, understood the gesture and placed the cap respectfully as Millar ground on to the summit. For Millar, amid the din and clamour of an epic trial up the Ventoux, tradition and respect was maintained. Stage 14 of the 2013 Tour de France wasn’t a magic Millar day. Millar was part of a large breakaway group of riders barreling along at a punishing pace, clear of the peloton, heading for the city of Lyon. With 10 kilometres to go, his goose is cooked. He turns to the motorbike cameraman and flashes a look of ‘what can you do?’, followed by the classic throat slit gesture. Game over. Rewind one year and the Millar magic is alive and well. In the 2012 Tour, a tour of unparalleled British success (seven stage wins shared between Froome, Cavendish, Wiggins and Millar), Millar’s win on stage 12 was a standout moment by being slightly unexpected, and coming as it did on the anniversary of the death of Tom Simpson. In classic Millar style, this was no coincidence. Millar is an ex-doper who often refers to himself as such. He doesn’t avoid this fact and he doesn’t skirt the issue. In fact, if an interviewer is remiss enough to not bother bringing up the D word it seems Millar will often do it for them. In his book ‘Racing Through the Dark’ he illuminates some of the murky corners of the sport, and describes how an ambitious young rider could so easily be dragged into these corners by the team management and the grizzled old pro’s. Millar puts himself out there on a platform as the reformed doper and as a lightning rod to draw in the debate and move it on. He doesn’t have to do that. The mistakes he made as a young rider will always polarize cycling fans – to some he will always simply be a cheat – but even his detractors should acknowledge the work he does to maintain doping as a live debate, and as poacher turned gamekeeper through his work with the doping authorities. It is no longer acceptable in the eyes of most fans for riders to plead ignorance or disinterest when quizzed about doping. Cycling has the feel of having entered a new era of openness post Armstrong, and Millar deserves great credit for the part he has played in that.